We made our first single ('Find somebody to love'/BW 'place called love', October 1965) for PYE and hit the road as a RECORDING ACT. We played on the same bill with all sorts of top names - The Who, (we jammed with them on one night) Fleetwood Mac, Rod Stewart, The Yardbirds (with Jeff Beck), The Prettythings, Dave Dee etc., Peter Green and many, many more! There was not a corner of the UK (and darkest Scotland) we didn't play in. We did radio (our own show!) and TV, we once played LIVE on the BBC pop flagship show SATURDAY CLUB, hosted by Brian Matthew, to approximately a 2000 audience and 22 MILLION listeners. Spooky – and on brother John's 21st birthday too! (21st May 1965). We had a (screaming!) fan club run by the lovely Maggie Reynolds to complete the rock-star image. 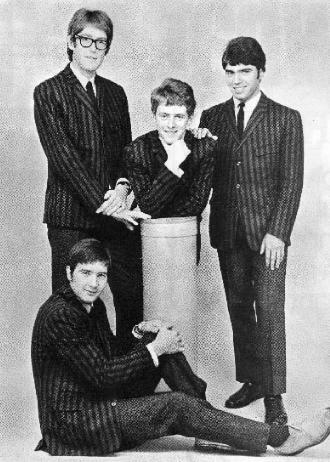 A nine single, one album deal was struck with PYE and our second single was released ('It's all for you'/BW 'Ma's Place', April 1966). Joined on these tracks by DON SHINN – organist with 'ROD STEWART AND THE SOUL AGENTS' (Note: Don went on to be the organist with DUSTY SPRINGFIELD!). We were on our way to STARDOM, and then two things happened just as we were about to tour EUROPE. First the singer, Tony, lost his voice, secondly THE TROGGS (who used to be our supporting act at some venues) got a number one in the USA – that was it. Career number two beckoned for me (yes, starting OWENS!) - sorry Reg – you're still going strong and I am very pleased! Martin went to drum with 'GENTLE GIANT' and brother John carried on with 'the new meddyEVILS' for a while with IAN DUCK (ex THE CLASSICS) on vocals and guitar before starting THE QUICK ('Berts Apple Crumble' a DECCA DERAM 'classic' and a Number One hit in ICELAND!). Tony went on to be an art teacher in the Midlands and we are not sure if he carried on with his singing.